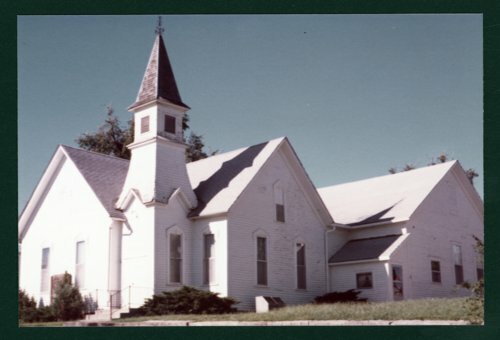 This colored photograph shows the Methodist Church in Harveyville, Kansas. The structure, completed in February of 1892, was dedicated by the Rev. William Quayle, President of Baker University. For 120 years, members of the community gathered at this church on the hill. On February 28, 2012, an EF-2 tornado destroyed the building. A new church was later built at 371 Wabaunsee Street, the site of the previous structure. The dedication for the building was held on July 28, 2013 and conducted by the United Methodist Bishop Scott Jones.